Promise U. : Kathie Hill Music, LLC, Making music with and for kids for over 25 years! Home :: All Kid's Musicals A-Z :: Promise U. It's the annual "Cram 'n Jam" at Promise University - time to study for the big P2F2P2K exam, or "Precious Promises to Famous Followers of the Past 2000 Years!" Dee jay "Stan the Man" provides music for jammin' while student body president, Valerie Dictorian leads the crammin' as the P.U. students review God's promises to Paul, Martin Luther, Pocahontas, the Wesleys, Harriet Tubman and missionary Gladys Aylward. History and Literature professor Juan Zaponatime, sophomore wrestling champ, Marvelous Marty and Music teacher, Senora Doreme Fasolati are just some of the zany characters on the Promise U. campus who help to share God's promises through a variety of presentations and musical styles. Before the Cram 'n Jam closes, the kids realize that the greatest promise is "Whoever calls on the name of the Lord will be saved" and that God's promises are for all believers, whether they lived 2000 years ago or today! "Promise U" was THE BEST musical I have directed - and I've done many! I loved the music (especially the new versions of older songs like "Just As I Am" and "Precious Lord, Take my Hand"), loved the creativity in the drama, and loved helping the kids learn some church history. My kids have done well with other musicals but this one far exceeded the others. Kathie, thank you for writing "Promise U." "Promise U" is so packed with good things, it's hard to know where to start. The songs are great, the drama is fun and the kids learn SO much about their Christian heritage. There is not a wasted moment in all the teaching plans. I have adopted the theme verse as one of my own life verses - "they believed His promises and sang His praise." Kathie’s Note: This musical is timeless in its introduction of Christian figures through history. From Paul’s conversion to the “real” story of Pocahontas to the “chill bump” moment of the video footage of Billy Graham (included in the Director’s Aide and Video) this musical is witty and winsome, ending with a strong salvation message. 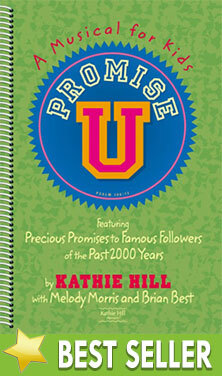 Promise U is another of my favorites, especially for involving older children or teens in your program. Downloadable 3x licensed PDF of all songs, script, production notes & piano transcriptions with permission to make 3 copies . Additional copies require purchase of additional 3x license/s. Up to 200 downloadable pages of lesson plans, kick-off ideas, musical & spiritual activities and production & organizational helps. Songs, script, production notes & piano transcription - pristine. Grab this great price while you can! Choreography demonstrations for up to 7 songs in musical plus staging, costuming and prop instructions.